The world of sports technology is exploding with innovations. Sports Techie has come across another creative invention in the FBV™ (Flat Bottom V™) skate sharpening system from Blackstone®. Several days ago I was clueless about the skate sharpening sportsbiz world. Now I get it and so will you after this blog. By having a customized Professional sharpening, you improve the ice skating blades ability to provide more speed and agility with greater power. According to Steve Wilson who co-founded Blackstone Sport with his Father in Kingsville, Ontario, Canada, their company goal is, “to make you skate better” which their sports tech products indeed help you do. Blackstone Sport website link: http://www.blackstonesport.com/index.cfm. Steve and his Dad invented the Blackstone ‘Spinner’ dressing system that uses a stone wheel to create the edge on your skating blade that you want. A traditional square or hollow can also be made with their machines. It is important to know what hollow you are skating on because it affects your skating technique and how your blade reacts with the ice. Their innovative ice sharpening machines were used at the Salt Lake City, Torino and Vancouver Winter Olympic Games. They have an eye towards providing Sochi with their latest innovations in 2014. National Hockey League players from most all the teams enjoy the competitive edge provided by the Flat Bottom V. Top College programs such as Boston University and Michigan incorporate Blackstone into their formula to help win games. B-leaguers, recreational and youth programs, and figure skaters, all have Blackstone inventory worldwide. See this TSN “That’s Hockey” feature on FBV skate sharpening via the Blackstone YouTube channel: http://youtu.be/y6E3h7mFqKQ. I asked him about Blackstone and the Green movement. Steve stated that their company footprint has decreased a ton (literally) since they first began in business. In days past, “you needed to change the dressing all the time,” he explained. Now with his machines, “there is no need to change the wheel very often.” There is much less rock grinding and dust flying everywhere by using their machines technological advancements. Blackstone Sport is a privately held company with 14 employees. Manufacturing is all done in Canada. Batches of one hundred can be built over a couple weeks time. They range in price from under $1,000 for the X-Series Portable Machine to $22,000 for the Stealth Triple Head Machine. Connect with Blackstone Sport Social Media on Twitter and Facebook via their web site. 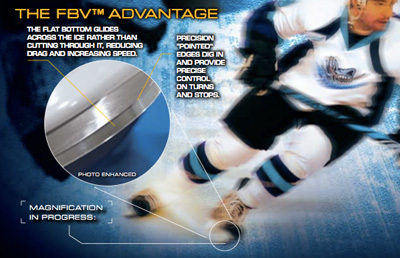 Be sure to visit this Blackstone Sport web page that helps explain the FBV Technology, and the History of skate sharpening: http://www.blackstonesport.com/technology.cfm. A new product on the horizon is the A-Trap for hockey goalies. This new design made for a goalies’ skates allows them to be able to push and to use the inside edge needed to skate faster. If you feel the need for more speed and skating ability on the ice, give Blackstone FBV your special attention. Thanks to Matt at Blaze PR for introducing Sports Techie to Blackstone Sport.